Autoradiography can be used to identify receptor binding sites (known or unknown) and distribution of a radiolabeled drug in a tissue or organ section. The radiolabeled compound can be given either to the live animal followed by sectioning of the tissue and imaging (ex vivo autoradiography) or cryostat-cut tissue sections can be incubated directly in the radiolabeled compound and imaged (in vitro autoradiography). The radiolabeled drug is administered via a tail vein. The animal is then sacrificed and the target organ(s) dissected free and snap-frozen. Sections are cut using a cryostat, dried and exposed to a phosphor screen together with autoradiography standards. Cryostat-cut tissue sections are incubated with the radiolabeled drug until equilibrium is reached. The sections are washed in fresh buffer to remove unbound radiotracer, dried and imaged using either phosphorimaging or beta imaging. 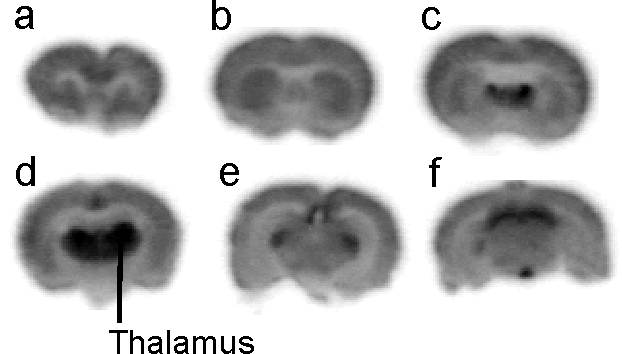 Autoradiography in brain from a mouse administered the radioiodinated cannabinoid CB1 receptor radioligand, [125I]AM2233. Sections (coronal) imaged using phosphor imaging. Radioactivity distribution is consistent with selective binding to the CB1 receptor. 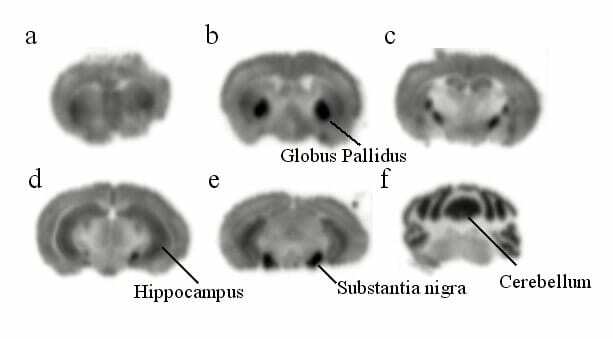 Ex vivo autoradiography in brain from a rat administered the radiofluorinated α4β2nicotinic receptor radioligand, [18F]A85380. Sections (coronal) imaged using phosphor imaging. Radioactivity distribution is consistent with selective binding to the α4β2 brain nicotinic receptor. Ex vivo receptor occupancy assay: [3H]DAMGO binding to opiate receptors in rat striatal sections. Sections on the left were from a vehicle-treated rat and sections on the right from an animal that had been treated with naloxone (3 mg/kg) prior to sacrifice. After being cut the sections were incubated in vitro in [3H]DAMGO for between 1 to 45 min. 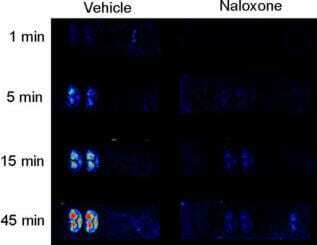 [3H]DAMGO binding is reduced in the naloxone-treated rat at all time points due to occupancy of receptors by the naloxone.